What is the best sealer for concrete countertops? Sealers for concrete countertops have improved a lot over the years. Un-sealed concrete is porous and susceptible to staining and chemical attack. Liquids will soak into the surface and stain the concrete. Acidic foods like lemon juice, lime juice, and vinegar will dissolve the cement paste and etch the surface. The "best" sealer for concrete countertops must meet some basic principles that are important to both the potential owners and the contractor making the countertop. So, incase you haven't figured it out already, there is no "Best" one size fits all sealer for concrete countertops. There are advantages and disadvantages to each kind. The important thing is to choose one that's best for both the owners and the contractor. factors stated above, although some come close. Concrete countertop sealers fall into two basic catagories: penetrating sealers and topical sealers. Both of them have their advantages and some drawbacks. Choosing the right one is a matter of weighing the pros and cons of the environment the countertop will be installed in. The three common types of repellant sealers are siloxanes, silanes, and fluoropolymers. Repellant sealers change the surface tension properties of concrete so liquids bead up and are easily wiped off. Siloxanes and silanes are both silicone based materials that penetrate deeply into the concrete. They don't leave a film on the surface so there's no change in appearance, (color or sheen). of the concrete (like a coating) in addition to being a repellant. Repellant sealers are very abrasion resistant because they become part of the concrete structure, they're also heat resistant and UV resistant. Once a penetrating sealer is applied to a concrete countertop, no other sealers can be applied, except wax, without risking them peeling off. If the concrete is polished over a #200 grit, penetrating sealers are usually the best choice. applied as the finish coat. Topical sealers provide a coating on the surface of the concrete. There's a wide range of topical countertop sealers available with varying degrees of appearance and protection. Wax is as basic as sealers come. Depending on how much is used, wax can be both penetrating and film forming. Usually a high quality floor wax that contains carnauba and bees wax or just pure bees wax is used. Automotive paste wax should never be used on concrete countertops. Wax will darken bare concrete and bring out the color while producing a low to high sheen finish. Wax is easy to apply and reapply and must be applied frequently to be effective. It's not a very good performing sealer, most anything will leave a mark or stain on waxed concrete if left on long enough. Hot pans can cause the wax to soften or melt. Lemon juice and vinegar will strip off the wax and etch the surface of the concrete. Sometimes wax is applied over other sealers but, all in all, it doesn't really provide much extra protection. Acrylic sealers are either solvent based or water based and are a one-component type of sealer. These are mostly used on exterior concrete flatwork and concrete floors. The solvent based acrylic sealers come clear or can be pigmented with most any color you want. Both water and solvent based versions are UV resistant, fairly easy to apply, and inexpensive compared to epoxies and urethanes. Solvent based acrylics will darken the concrete and leave a glossy sheen on the surface. Water based acrylics don't darken the concrete nearly as much and leave the concrete looking similar to what it looks like without any sealer. Acrylic sealers are applied very thin either by brush, roller, or sprayed on. On a hard, dense surface like a countertop the sealer just sits on the surface. They offer fairly good stain protection but scratch easily and require reapplication quite often. Acrylic sealers only offer modest heat protection. 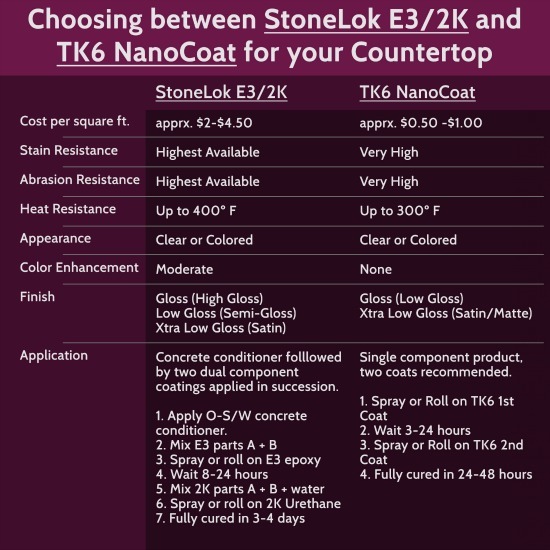 Most epoxies used to seal countertops are very similar. They are two component liquids consisting of a resin and a hardner that chemically react when mixed together. They give you a very hard and durable surface that provides very good stain protection. There's three basic types: solvent based, water based, and 100% solids. Epoxies that are 100% solids have no solvent or thinner in them meaning all the material that's mixed together reacts to form the coating. Most epoxies will yellow when exposed to direct sunlight and start to chemically breakdown unless a UV inhibitor or pigment is used. appearance of a plastic looking coating on the surface of the countertop. Applying epoxies is more difficult than acrylics. They must be mixed accurately, applied quickly, and are sensitive to moisture. If any moisture is still in the concrete, bubbles can occur resulting in peeling. Urethane sealers for concrete countertops have many of the factors you want in a sealer. There are single component and two component urethanes, water based and solvent based ones. Urethanes are very stain, chemical, and heat resistant. They provide excellent UV resistant and leave you a tough, durable, scratch resistant finish. Some versions of urethane sealers can bond right to the concrete and some bond better to an epoxy primer. The surface they are applied to must be properly prepared making them a little tricky to apply. If they're not mixed correctly and applied properly, they could peel. Urethanes tend not to want to stick to themselves making them harder to repair, and they're fairly expensive. Clean, dry, and dust free, successful sealing always begins with good surface prep. Bare concrete countertops always have to be cleaned before sealing them. The sealer manufacturer has instructions on the label, always follow them don't take shortcuts. Hardeners and densifiers react with the alkaline structure in concrete, so don't acid wash if using these, only use clean water. 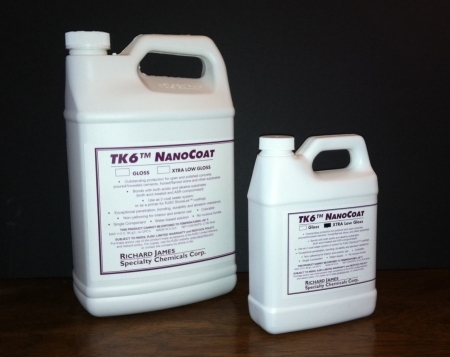 Topical sealers like a neutral surface, not highly alkaline or acidic. To get a neutral surface, use about 1/4 cup muriatic acid mixed with 1 gallon of water. You can use vinegar instead of acid if you like. to let the solution sit on the surface. Always neutralize the acid after cleaning with it. Mix 1 cup ammonia with 1 gallon of water and rinse off the surface immediately after washing with the acid solution. The ammonia/water solution will kill the acid and you can then rinse the surface with clean water multiple times so no residue remains. Wipe the surface with a clean, lint free cloth. Let the concrete air dry as long as the manufacturer suggests before you seal. IS THERE REALLY ONE BEST SEALER FOR CONCRETE COUNTERTOPS? The simple answer is no. There isn't one sealer that is all things to everyone. It's really about what YOU want as the owner/user of the concrete countertop. It's about what expectations you have and what the countertop will be used for. It's important you understand before choosing a sealer that an inexpensive sealer may be easier to re-apply, but it doesn't offer the same stain, scratch, or heat resistance a more expensive one will. It's important you understand cleaning and maintenance procedures for the sealer you choose. Know how your sealer will hold up to olive oil, lemon juice, red wine, and vinegar if your counter is for a kitchen. Know how your sealer will perform if it's in direct sunlight or outside. What happens if you cut on it or put a hot pot on it? performs very well against scratches. Applying this sealer to perfection takes some practice. It's more for pros than beginners. resistance. For beginners, this is a much easier sealer to start with. Both sealers are food safe. Both sealers are manufactured by Richard James Specialty Chemicals Corp. and recommended for use by Buddy Rhodes.